Being vegan doesn’t mean you have to miss out. This year, there are more vegan goodies on the market than ever before. As we grow more conscious of our eco-footprint, we're becoming more in control of what we choose to buy. Easter, is no exception as we try to avoid plastic and unethically sourced cocoa. Stylish, creative and scrumptious, we’re rather addicted to these zero-waste eggs from Goupie. There are 36 different egg designs, all re-usable and loaded with bite-size sticky toffee pieces. 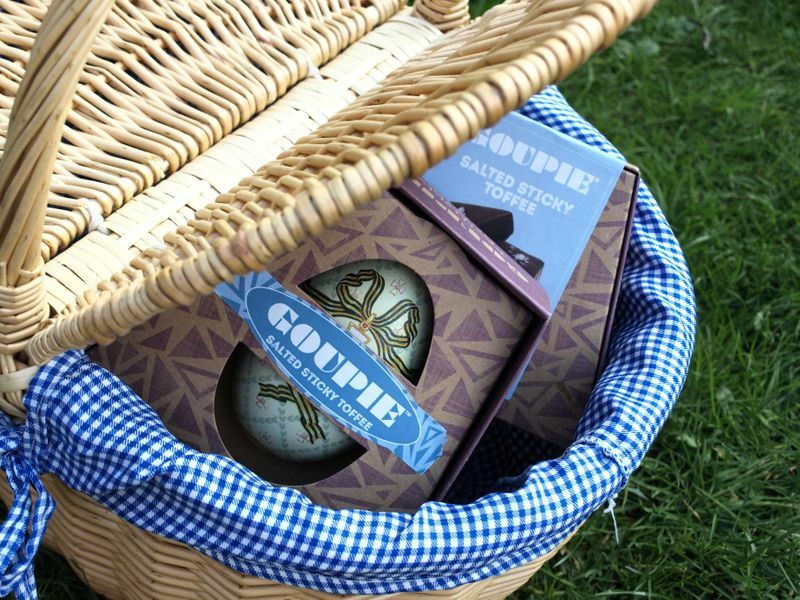 Save the eggs for future egg hunts, and visit Goupie’s website for refreshing ideas on how to upcycle your cardboard box and re-use your egg once you’re done. Which gorgeous design will you get? A luxurious Easter treat. You’ll instantly fall in love with the chocolate-loaded contents as soon as you open the lid. We’re talking heavenly hazelnut chocolate spread, vegan wagon wheels, fudge, biscuits, strawberry white chocolate and more! 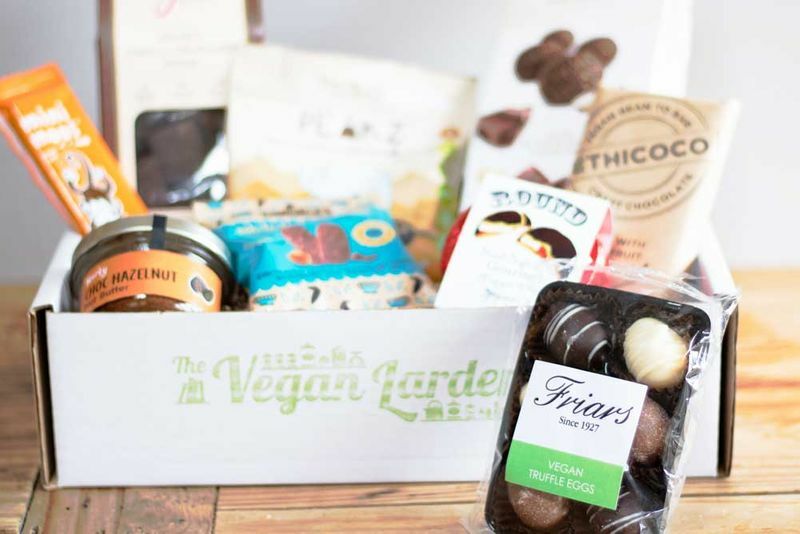 The Vegan Larder has done a terrific job in sourcing inspiring chocolate treats from lots of independent creators, giving you the freedom to graze away on new brands. Even better, all orders placed before 16th April will receive a free pack of truffle Easter eggs (while stocks last). Cute alert! These ickle crochet bunnies make our hearts throb. Handmade in the UK from 100% cotton yarn, each bunny comes with its own crocheted bed, sheet and wonderful personality. Imagine a child’s face when they crack open an egg to find this adorable face looking back at them? There are lots of different colour combinations to choose from and their size makes them the perfect pocket buddy! They can go anywhere -including an egg hunt of course! A bar of heaven. Delicious vegan chocolate swirled with Biscoff spread and topped with crunchy caramel biscuits. Upgrade your order to a giant slab to let the family tuck in with no arguments. Decidedly Different Gifts do exactly what their name promises: unicorn pops, dinosaur bars, giant jazzies and bars topped with cola bottle sweets. Their distinctive range is forever growing. Chocbox’s attention to detail is not to be missed. These dreamy eggs feel like they’ve fallen down from space and are both beautiful and delicious. There is no plastic here. Packaged in bags of five, the clear film is made from wood pulp so is 100% compostable. Looking for a gorgeous Easter-themed decoration? Then you’re in the right place. 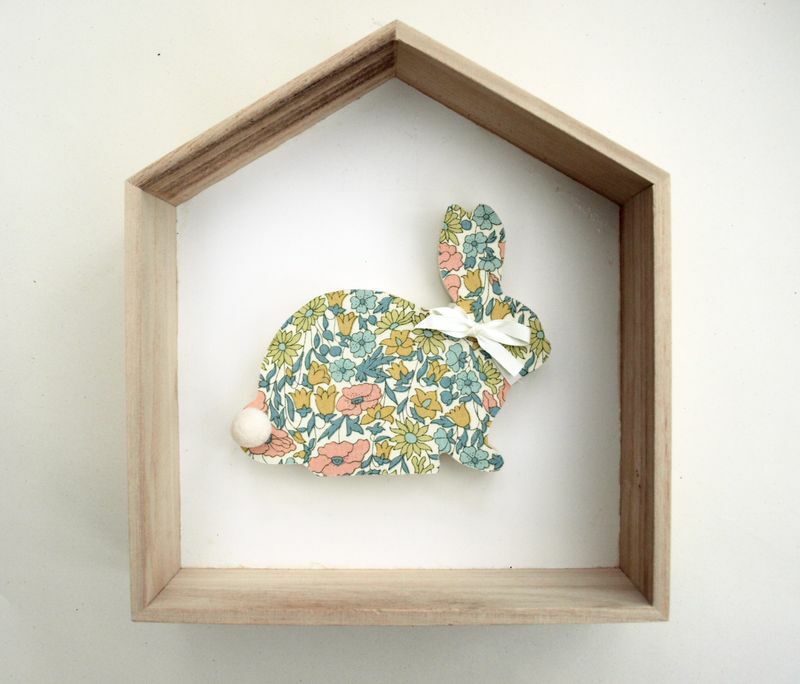 Laura handcrafts wooden bunnies, decorating them in pretty Liberty London fabric, ribbons and pom pom tails. Imagine this nestled in the garden for children to find, or standing elegantly next to your breakfast platter of hot cross buns? Let these bunnies become part of your family’s Easter traditions. A fudge twist on the popular cream egg. Unlike shop-bought Easter eggs, these are solid fudge all the way through! Their gold and silver swirled finish make these pure bliss. Fab Fudge also makes tubs of cream egg fudge which literally melt in your mouth. All profits from Fab Fudge go toward co-founder Jill’s Multiple Sclerosis treatment in Moscow. Transform your babies and toddlers into ridiculously cute Easter-themed animals. Yes, we can hear you thinking about Instagram-worthy photos. Made using the finest and super-absorbent 100% cotton, there’s no need to worry about them loosing their softness after each wash. From bunnies to lambs and chicks, these towels from Bathing Babies are perfect Easter treats for parents who don't want to buy chocolate. For an extra special touch, you can personalise your towel with an embroidered name on the back. Step aside hot cross buns, there’s a competitor in town. Cocoa Loco, the masters of creating homemade fair-trade and palm-oil free chocolates, has mastered a hot cross bun truffle. Be warned, they are creative, fun and moreish so we recommend that you order more than one box. With 80 million Easter eggs sold each year in the UK, we’re turning to eco-eggs options to minimise our footprint. Well, these quirky looking eggs from Montezuma has nailed minimal waste. Made from just two parts: a sturdy biodegradable paper outer shell and a foil wrapping, there isn’t an ounce of plastic in sight. The organic eggs themselves, come in either milk chocolate with butterscotch, dark chocolate with cocoa nibs and new for this Easter, organic white chocolate with raspberry. ﻿Celebrating your baby’s first Easter? We’ve found the best gift. This bright and bold chick rattle is perfect for your baby’s first Easter basket. Printed onto cotton poplin fabric from an original watercolour illustration, these chicks are playful, soft and sweet. Why not add them to a sensory basket? Use the rattle to explore the theme of Easter or the colour yellow. Without a doubt, this will get your baby smiling and exploring. Mrs Pott’s chocolate house, home to Bristol, is real delight. Making the finest hot chocolate, cakes and biscuits, this cafe offers generous vegan options including a chocolate chip cookie sandwich with a dark chocolate ganache filling. For those unfortunate to visit, you can see what the fuss is about by trying their new range of vegan chocolate bars. Thick, crunchy and loaded with flavour, you can order the bars from their online store, including free postage for a limited time only. Wanting something personal this Easter? This charming bunny is your answer. Lovingly hand-stitched in the UK, this felt bunny, decorated with a Liberty London fabric bow can be personalised with any name. Hang it up in your child’s room for when they wake up on Easter Sunday, or decorate a tree in your garden as part of an egg hunt. Cuddles and Kisses also make personalised Easter charms, bows and signs, so you’re spoilt for choice here. ﻿Everyone loves chocolate buttons! These little droplets of bliss are perfect prizes for Easter hunts. They contain live cultures to help keep little tummies happy and healthy, while the packaging is completely compostable! Your search for a zero-waste chocolate goody is now complete.